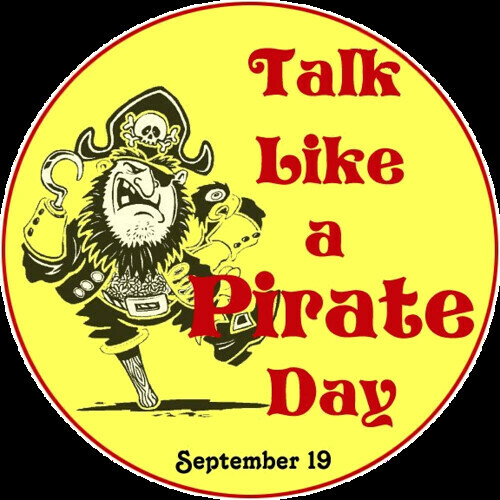 International Talk Like a Pirate Day (ITLAPD) is a parodic holiday invented in 1995 by John Baur (Ol’ Chumbucket) and Mark Summers (Cap’n Slappy), of Corvallis, Oregon, who proclaimed September 19 each year as the day when everyone in the world should talk like a pirate. For example, an observer of this holiday would greet friends not with “Hello,” but with “Ahoy, me hearty!” The holiday, and its observance, springs from a romanticized view of the Golden Age of Piracy. Lift the skin up, and put into the bunt the slack of the clews (not too taut), the leech and foot-rope, and body of the sail; being careful not to let it get forward under or hang down abaft. Then haul your bunt well up on the yard, smoothing the skin and bringing it down well abaft, and make fast the bunt gasket round the mast, and the jigger, if there be one, to the tie. If the ship go before the wind, or as they term it, betwixt two sheets, then he who conds uses these terms to him at the helm: Starboard, larboard, the helm amidships… If the ship go by a wind, or a quarter winds, they say aloof, or keep your loof, or fall not off, wear no more, keep her to, touch the wind, have a care of the lee-latch. all these do imply the same in a manner, are to bid him at the helm to keep her near the wind. The only written records recovered from the Adventure after Blackbeard’s death ran as follows. Such a day, rum all out- Our company somewhat sober- A damned confusion amongst us !- Rogues a-plotting – Great talk of separation- so I looked sharp for a prize- Such a day found one with a great deal of liquor on board, so kept the company hot, damned hot, then things went well again.